GB Tell me why you’ve chosen this frontispiece. NM I live for frontispieces; I wish we still had them around. They announce the intention of the book or pamphlet, and function as a sort of press release, table of contents, flap copy / jacket copy, all in one. GB Does your knowledge of the psalms influence your view of its beauty? NM Yes! What’s great about collections of psalms is that they are all basically the same (inasmuch as they reference, in translation, the same collection of 150 texts). But then there are innumerable differences in translation, tone, intention, style of printing, subtleties in line breaks, etc. Whenever I encounter a new translation of the psalms, I always rush right to 51, 99, 104, and 150, as I know those ones quite well in a couple of versions. Do you have those friends who obsessively always order one thing at new restaurants? I am the sweetbread guy; I’ve a friend who is the octopus lady. It’s the same with the Psalter — you rush to the ingredients you know to see how the rendition exposes truths about the collection. 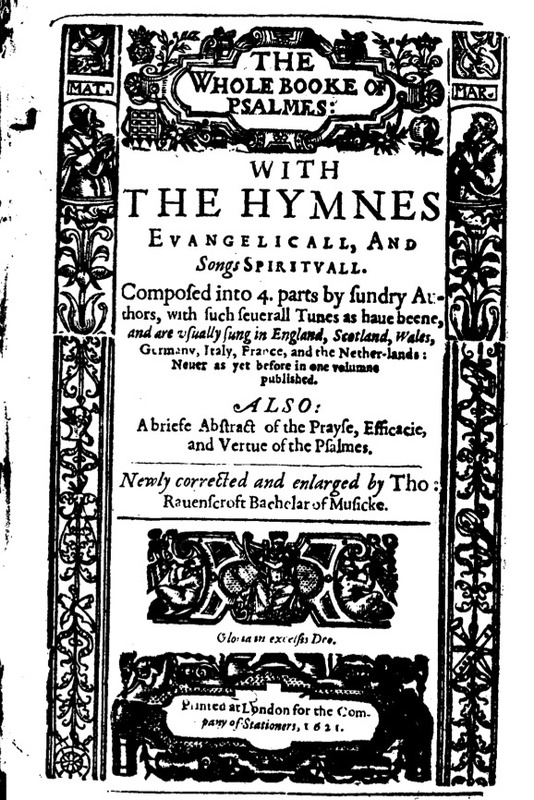 GB In 1621 these psalms were sent to Plymouth, which was then a brand new colony in New England. Do you think it’s possible that we have an inherited ancestral feeling for beauty in things? NM How interesting; I mean, I grew up in the Northeast where the early colonial history was integrated into everything we did. School trips constantly involved women in historical dress demonstrating how to use a loom or churn butter. I’d like to think that my sense of beauty is actually more informed by utility than anything else; I went with my boyfriend to a strange recreation of a 17th century print-shop in Maryland and pestered the leather-aproned man about ligatures for like, forty-five minutes until he feigned some colonial illness and took his leave — as it turns out to rush to the desk and google the answer to the question about the “sl” ligature. GB We look at so many things digitally nowadays. Do you think you would have found this as beautiful in 1621 when it was printed? Or is it the history, the imperfection of it or the strangeness of the type that make it beautiful? NM The first few years I was in university we had access to EEBO — Early English Books Online. I liked very much the idea that somebody, somewhere, was scanning in these broadsheets and then granting me access to them in the odd hours of the morning. The result of this access, though, is that whenever I encounter an actual old printed book I feel like it’s some Saint’s Fingernail that I have to venerate. I was shown a Gutenberg Bible at the Smithsonian in Washington and was almost embarrassed to look at it. For me, the beauty is simultaneously in the recreation of the thing on a screen, and in the preciousness (in the catholic sense) of the original document. GB Do you think that contemporary music is also beautiful in a different way from music composed in the 17th century? Is it a different kind of beauty? Do you ever consider this when you’re composing? NM I try to worry about it as little as possible. That having been said, I think the spirit in which most music was made in the 17th century is more exciting to me than the contemporary model. Back then, most composed music was made for the glory of God or the government, and the deadlines were hard and often — one got the sense of the Kapellmeister rushing every week to make the very physical deadline of the choir arriving and needing parts. I think now there is a Romantic idea that the composer is handed a small pile of money and told, go away for two years and make us something beautiful. But when you think about it, all of that Gibbons and Byrd and Tye and Tallis was made quickly! NM I don’t think about it too much because I change my mind through repeated exposure; I used to be one of those people for whom coriander tasted like soap and now I crave it all over my person at all times. It is an herb of great beauty. So many things are beautiful: things that took no effort, or even the opposite of effort, things that took years, accidents, disasters, early Meredith Monk, small pills, Grand Central Station, what the windstorm has done to my street.